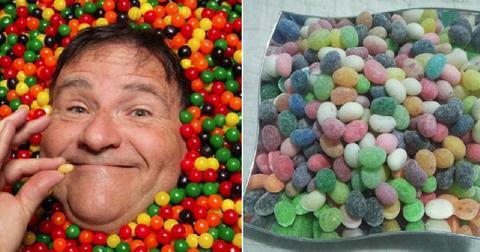 David Klein is the genius who invented Jelly Belly jelly beans in 1976. After selling the rights to the brand in 1980, Jelly Belly became as American as apple pie. Ronald Reagan fell in love with the snack when he was trying to give up smoking, ordering 60 cases a month and even sending some to outer space on Challenger in 1983. Rather ironically, the snacks that Reagan loved are now getting a dose of cannabidol (CBD). Klein is bringing the jelly bean into 2019 with Spectrum Confections, a line of CBD-infused jelly beans, just in time for Easter. I love me some candy with CBD. According to Cannabis Aficionado, Kelin was recently reading up on the medical benefits of CBD, which has been found to relieve pain and reduce anxiety and depression, among other positives. Klein says he then found himself asking "is anybody doing a jelly bean with CBD?" Unable to find anything, he set up Spectrum Confections and started producing CBD jelly beans in 38 different flavors. Klein says toasted marshmallow, piña colada, cinnamon, spicy licorice, and mango are among his favorites. According to their website, each bean has 10 mg of CBD and is sanded with dextrose to mask the CBD flavor. There's also sugar-free and sour varieties for anyone looking for something a little different. Klein hopes the beans, which cost around $2 each, but are only available in bulk to retailers at the moment, will help introduce CBD to those who could see a medical benefit. Our new Spectrum® CBD jelly beans. In a reply to a comment on Facebook, Spectrum Confections wrote, "we are the manufacturer and only sell bulk units to distributors. We are seeing our vendors sell for approximately $2.00 per jelly bean with 10mg."